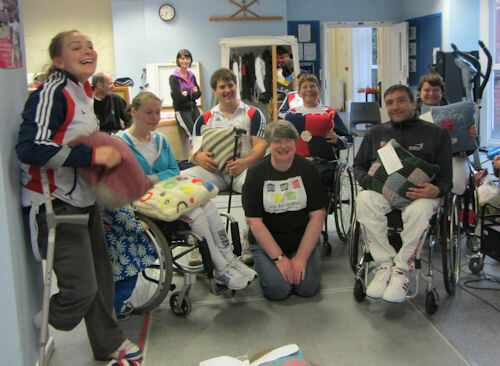 On 16 June the Team GB Wheelchair Fencers were able to choose their Woolsack cushions at a training event in the Midlands. They were delighted to receive the cushions and will be personally thanking those who had included contact details on the card with their message to the recipient. They send their thanks to all those people who have made these gorgeous cushions. I was the lucky person who visited the fencers, and was fascinated to find out more about the sport, as well as having the pleasure of meeting the Paralympic team and other fencers & support staff. I'm very much hoping that Wheelchair Fencing will be shown on television.